Jason Peck recently teamed up with a number of sports and social media industry thought leaders to create an insightful ebook that details Sports and Social Media Predictions for 2011. I highly encourage you to take a few minutes to read through the free piece, as I am sure you will gain some valuable nuggets of information that you can share with clients, colleagues, and friends. 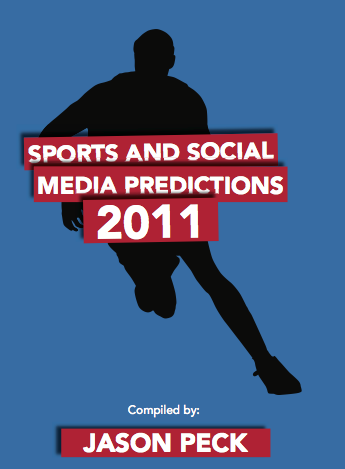 The 2011 Sports and Social Predictions document features opinions, thoughts, and predictions from 17 industry professionals. Check out Jason Peck's site, Take a Peck, as well, which serves as a tremendous industry resoure for all professionals working in sports and social media. Hats off to Jason, Ash Read, and all the thought leaders who contributed to create yet another terrific industry resource!